Happy Saturday crafty peeps!!! Today marks a new challenge at Our Creative Corner! 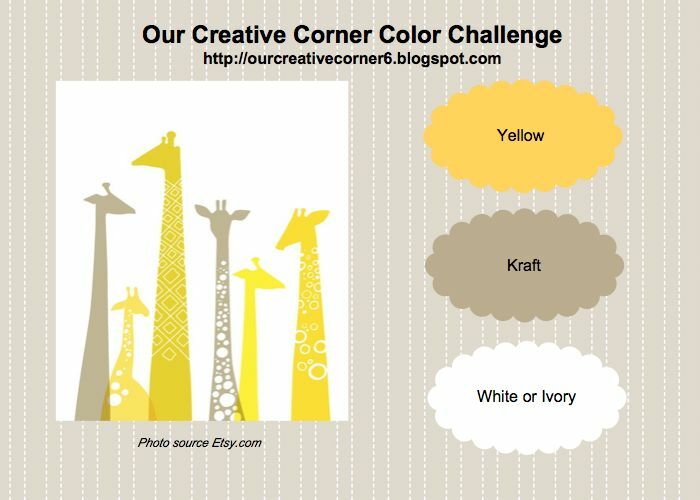 Anne Marie, of Stampin' Anne, is hosting again, and this week she has a color challenge for you based on this picture. 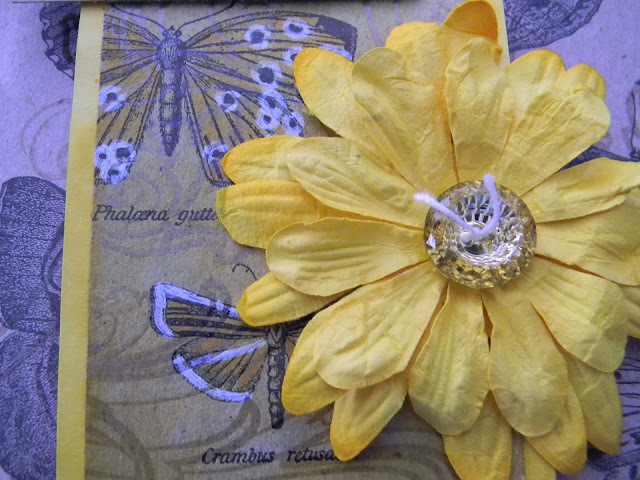 Make a project using yellow, kraft, and white or ivory, then upload it to the OCC. If you need inspiration, you will surely find it with the Design Team. The projects this week are probably my favorites. Everyone really outdid themselves, and our Guest Designer, Anna Christensen, from Anna Christensen Crafts, made a fabulous card as well! 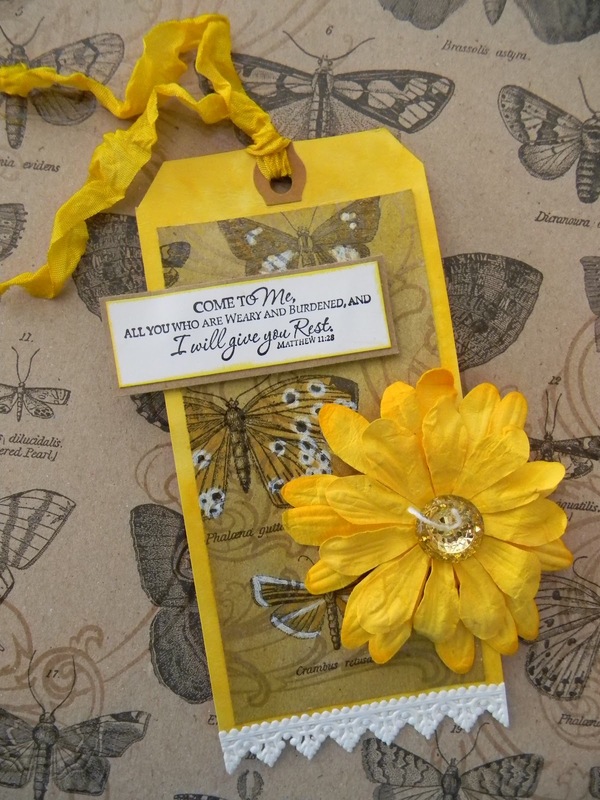 I needed to make four sympathy cards for a family who just lost their dear beloved mother, but I thought I would make more of a keepsake, so I went with a tag. These colors were perfect for this...warm and soothing, but yet bright. I also wanted to use Tim's technique of Marbled Stains (does the title make since now?) for the Compendium of Curiosities II Challenge this week, sponsored by Eclectic Paperie, but I had an issue, and I was too late for the challenge. I am submitting this to Inspiration Journal's challenge of "May flowers" though. 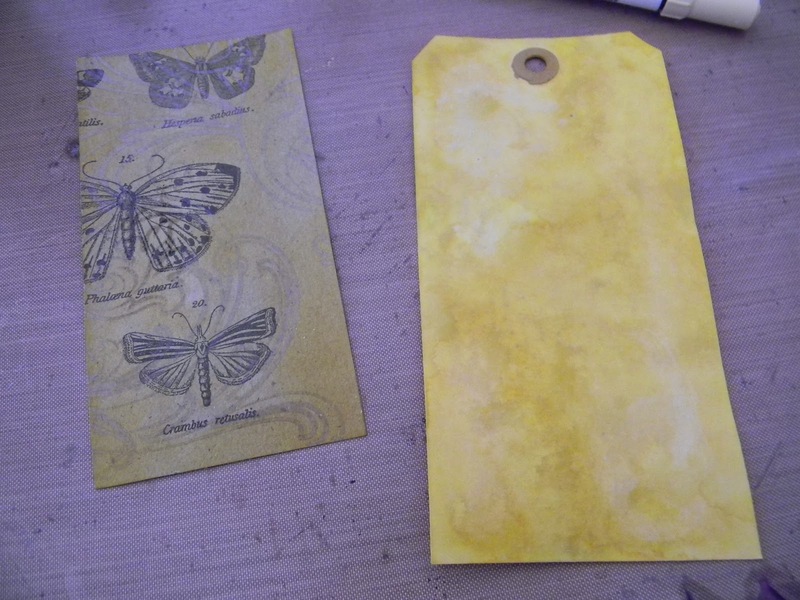 I decided to do the Marbled Stain on both the manila tag (which turned out great) and the Kraft Resist Paper, but the kraft didn't like it much, and you just can't see it well, hence, the issue. But, we must try new things, and always test out and play with our products to see what they can do, so I am okay with it. It still has nice color to it. After I adhered the kraft to the tag (yes, now my pretty marbled look is mostly covered up), I used Distress Markers to color in some of the butterflies. They look so cool, and I was so pleased how this tag came out. You can see the difference in color below, from the regular kraft to the colored. Beautiful keepsakes! That is the perfect scripture,too. It is amazing how those colors work together. Who knew? Such a beautiful expression of sympathy! 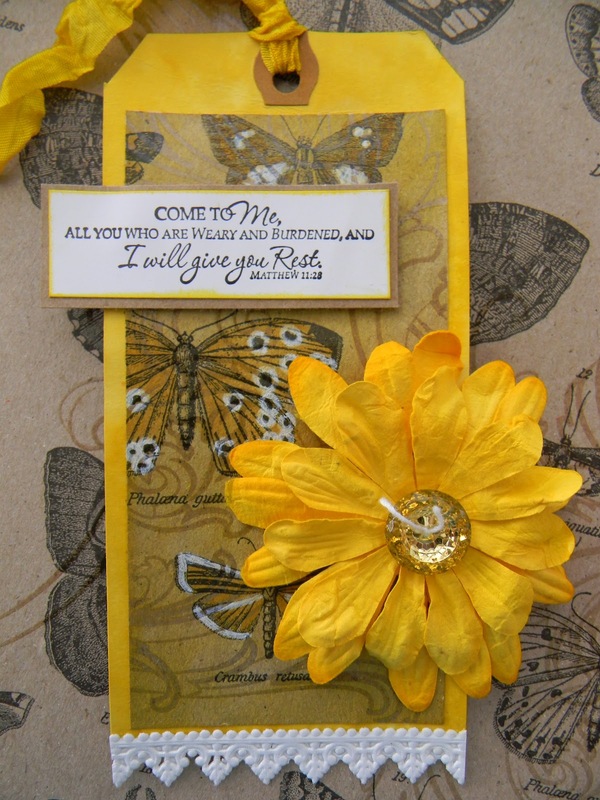 Love your tag and the beautiful stamped message!! Very beautiful, the yellow is gorgeous. Such a glorious piece of art. Every single thing is just right...just enough color, just enough embellishment...completely gorgeous. And that little bit of lace right at the bottom edge. Perfection! Love the marbled backgrounds. Very stunning! So great you used the flower after 10 years! Love the colors! Oh my goodness, I love this. Everything about it! One of my favorite verses, and I needed the reminder today. Anita, I just love how you did your tags! The marble technique looks fun and different. And I do agree, the colors look cheery and soothing. I love how your tags turned out too! I think the markers really helped pull this creation together. have a wonderful weekend, hugs, sharon w.
A most delicious shade of Yellow you have chosen to make your sympathy Tags, the colour emulates sunshine light and warmth. The eye 'sees' the highly reflective Yellow flower before anything else, it is a POW! And then I notice the butterflies, brilliantly coloured not too bright and not to muted, just right for me, your design is wonderful, and will brighten up any-ones day. Beautiful, Anita! Love the stains... you've built them up and your tags are gorgeous. Oh so beautiful Anita ... 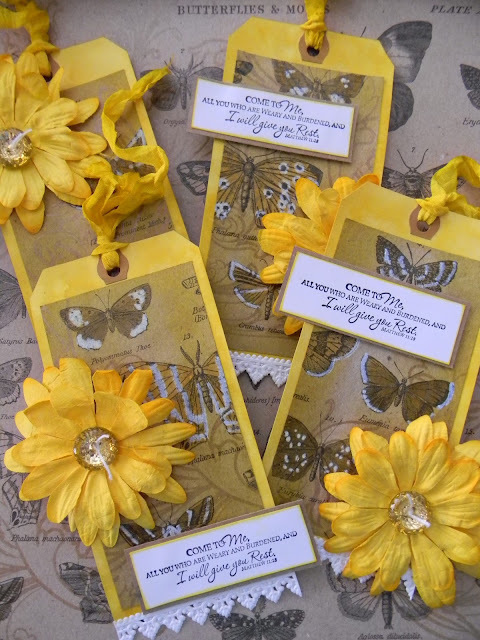 I just love your tags - I think these would be my most favourite - I love the marbled background, love the coloured butterflies and love the white lace ... stunning and striking!!! Hi Anita, your tags are gorgeous, I really like that marble technique and the butterflies are stunning. Hi, Anita, your creations are always so gorgeous! This is gorgeous!!! Love the lace at the bottom and the beautiful flower!!! WHat beautiful tags to receive for such a sad time. They are inspiring and gorgeous! 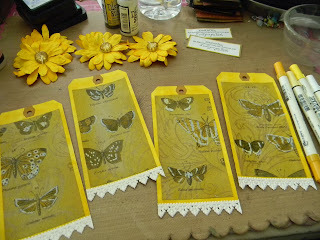 I love the butterflies and how you highlighted them with the white pen. Another great creation, what an honor it is to be on the DT with you!